A temporal tranquility was resolved in the family’s 11th street residence, an endowed progeny, Jan able to espouse to a full appointment as a stay-at-home mother, with Gary maintaining a work week appurtenant to the Kiowa Service Company. A review of his income, the minimum hourly wage having been raised but still lacking a require perquisite, the couple looking for a means of additional financial input. Jan having discovered a hidden talent, during the kindred visit to Gary’s family in California she had a habit of attesting a knitting agenda to occupy her time. Gary’s Mother interceding with a suggestion that crocheting was a faster and a more applicable contention, proceeding to instruct her already needle dexterity daughter-in-law the artistic composition of crochet yarn interlace. Jan proving to be a very astute study impressing Gary’s mother by immediately mastering the much faster and satisfying new-found art. The south rear entrance of the house when located on the farm was a basically a screened in porch accessing the kitchen, a place for the farming family to shed the garments of their labor before entering the house. Sometime during the past the porch was enclosed with windows and permanent door, its private entrance an area ample to embrace a possible business opportunity that Jan had been considering, an in-house crochet, knitting, yarn and accessories shop. Gary being somewhat skeptical but admitting his ignorance about the number of knitting and crochet advocates in the farming community. His first concern was making the area acceptable, but Jan was already ahead of him having decided to approach her father asking him to applying his talent to her idea. Bud agreeing to his daughter request suggesting instead of horizontal and vertical shelves, the wall console would be assembled at 45 degree angles, thus enabling a more effective means of stacking the hundreds of rolls of yarn. Bud setting to work making an unfinished entrance into a comprehensive small display room. The shelving installed, the room painted and made ready, entrance bricks being laid as a walk from the driveway, the only thing left was the purchasing of inventory. 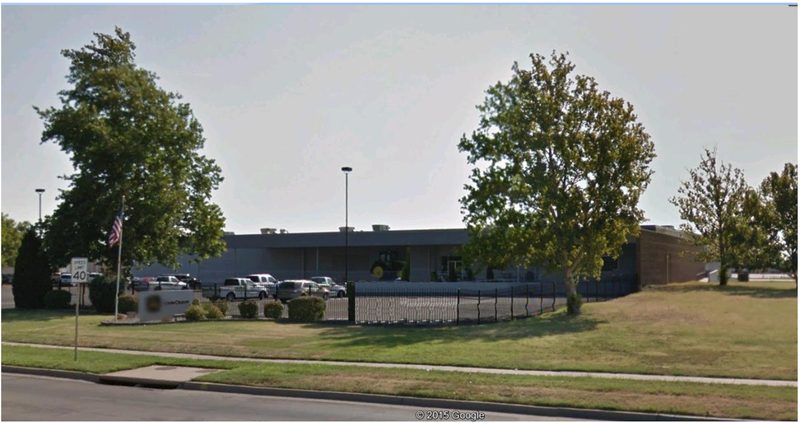 Gary well aware of their financial situation, pleasantly surprised when Jan mentioned that she had already talked to Marvin Ott at the Bank of Kiowa about securing a loan for the inventory. Jan’s Yarn Basket was open for display at 324 N. 11th St., a newspaper advertised grand opening announcement providing an influx of local congratulatory customers, their crochet, knitting and accompanying accessories needs fulfilled. The Murrow Construction Company was in an expansion mode, the building of a new shop and office was in progress, a 28 x 72 ft. shop and office being constructed to adjoin the Murrow residence at 1019 Dickinson St.. Bud acquiring and introducing a new paint distributorship to the community, Porter Paint, a renown application, catering contractor quality emulsions to prospective local and professional consumers. 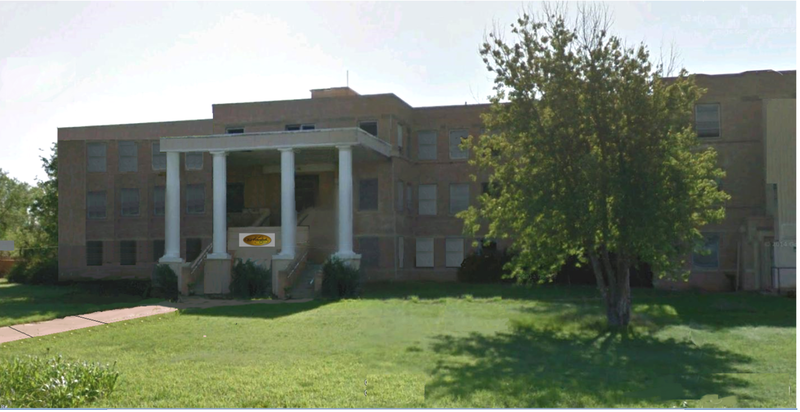 The small construction company with Don Palmer as foreman thriving with increasing business opportunities, Bud having bid on a major but very unusual construction project for the old Hardtner Achenbach Hospital that was in process of being converted into a long term facility to include the mentally challenged and handicapped. The new ownership concern desiring to have the facility entrance remodeled to replicate the four column entrance to the White House in the nation’s capitol. Gary wasn’t surprised that his father-in-law would bid on such a project as he had just completed work on another unusual project, an exceeding large monolithic cross as a backdrop for the pulpit of a church in Medicine Lodge. Bud having secured the Hardtner bid resolving some of the complexities of the project especially the construction of the columns, something that wasn’t a yard item at the lumber company. Gary admiring Bud’s ability to manage the paradox between his construction vocation, paint distributorship and his after work farming endeavor. Gary was at awe with the increasing business at Kiowa Service finding the John Deere enterprise in an amplification mode, the new assembly shop being completed, a removal of the old warehouse and loading dock, the relic of the Feed Grinding Mill being abolished, a new metal warehouse application constructed. The preferred rows of displayed tractors, now enhanced with a large consignment of the new 7720 combines and headers, the dealership in transposition towards a new horizon. The once apprentice parts person finding his mentor, Jerry Whitney mentioning that he wasn’t enthused about Miller’s combine inducement, preferring to remain true to his focus on tractors and their accompanying accessories. 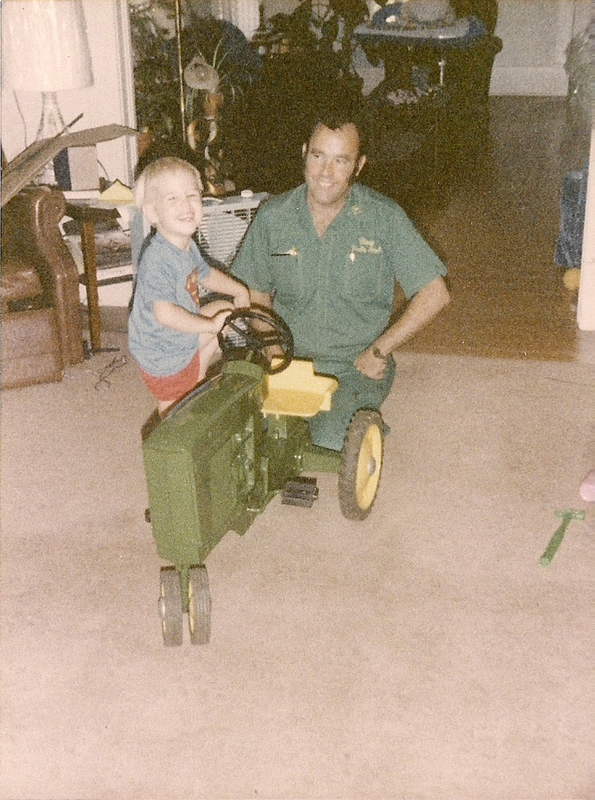 Gary very much aware of the direction and vision of the enterprising Steve Miller, cognizance of the changing diversification in parts inventory, Steve arranging for him to attend a two-day John Deere Parts instructional class in Wichita. 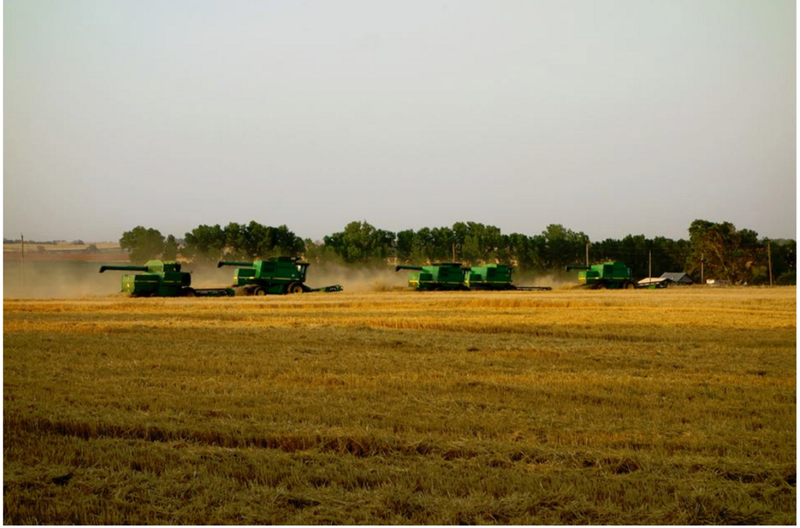 The migratory green machine wheat harvesters from Canada discovering Steve Miller’s compliment of combines accessible, their ranks capitalizing on John Deere’s volume discount, the Custom Cutters as they were labeled, with one party purchasing as many as five of the 7720 harvesters. 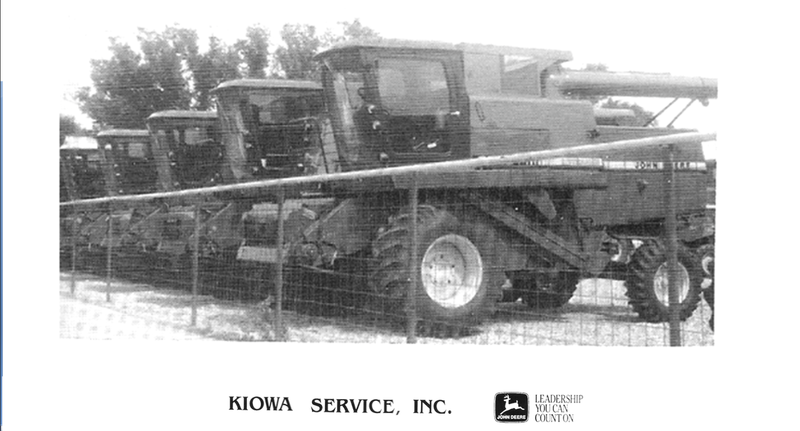 The once proliferate tractor sales now limited mostly to local farmers, the Kiowa Service wheat harvesting combines sales reaching a broad spectrum of the Harvest trail from Texas to Minnesota. Steve Miller’s ever broadening John Deere business highlighting the small community of Kiowa with Deere & Company and on the national map of commerce. This entry was posted on August 12, 2016 at 1:16 am and is filed under Uncategorized. You can follow any responses to this entry through the RSS 2.0 feed. You can leave a response, or trackback from your own site.